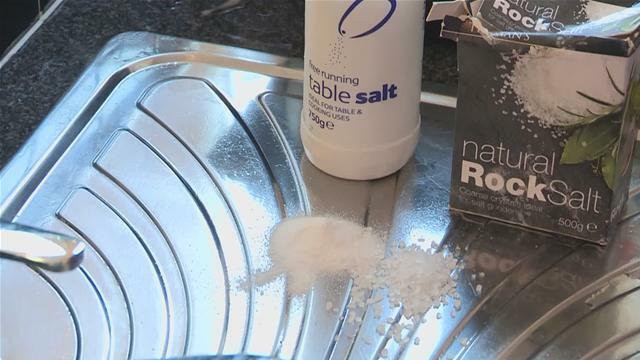 In the previous article we share with you some interesting and easy tricks how to clean with salt. Today we`ll share some more for your easy cleaning at home. Enjoy them and remember everyone will envy you for the good keeping home. 6. If you can not clean your iron , take an old towel, sprinkle salt on it and go with a hot iron several times in the towel. 7. When washing with sponges, have you ever thought that they could remain with bacteria? Did you know that can kill the bacteria if you put them into boiling salted water! 8. Each of us don`t like when ants appear in the house, right? I guess you all know how to get rid of them, but will still advise you – just sprinkle with salt around windows and doors. Then there will be no trace of ants. 9. When cleaning the floor, probably put not one or two agents! And do you know that when you put in the bucket of water a cup of salt is obtained twice as efficient cleaning agent from all other preparations? 10. If you have plastic flowers for decoration in your home and want to clean the dust, put them in a bag filled with salt and shake well. After removing the flowers, you will notice that they are like new! 11. Here’s the last, but not least, a way to keep the color of dark jeans and towels for longer. When washing dark clothes, put in a tablespoon of salt in the washing machine. Well, believe it, the colors remain saturated for a long time! We hope our article was been useful! And will be happy if you share some salty tricks with us. And do not forget- if you need professional cleaning just contact us. We can do the best end of tenancy cleaning or carpet cleaning for you in the right time.